This week, we feature a very unusual recent acquisition in a guest post by Special Collections curatorial assistant Elizabeth Ott, doctoral candidate in the U.Va. Department of English. In the world of Special Collections it may be said that some books are born rare, some achieve rareness, and some have rareness thrust upon them. The last is the case for the unassuming blue pamphlet titled Songs for the Philologists, which recently made its way to the stacks of the Albert and Shirley Small Special Collections Library. A strange admixture of chance and circumstance has conspired to make this pamphlet, co-authored by J.R.R. Tolkien and E.V. Gordon, the rarest publication of Tolkien’s career. The front cover of Songs for the Philologists, which lists Tolkien first among the volume’s authors. PR6039.O32 S65 1936, Gift of Joan Kellogg, 2013. During his tenure at Leeds University, Tolkien formed, with Gordon, a society known as the “Viking Club” devoted to reading Old Norse sagas and drinking beer. Sometime in 1934, Tolkien and Gordon prepared a set of typescripts of verses, including original compositions of their own devising as well as traditional songs in Old and Modern English and other languages. The typescripts were distributed to students from the club for their amusement. 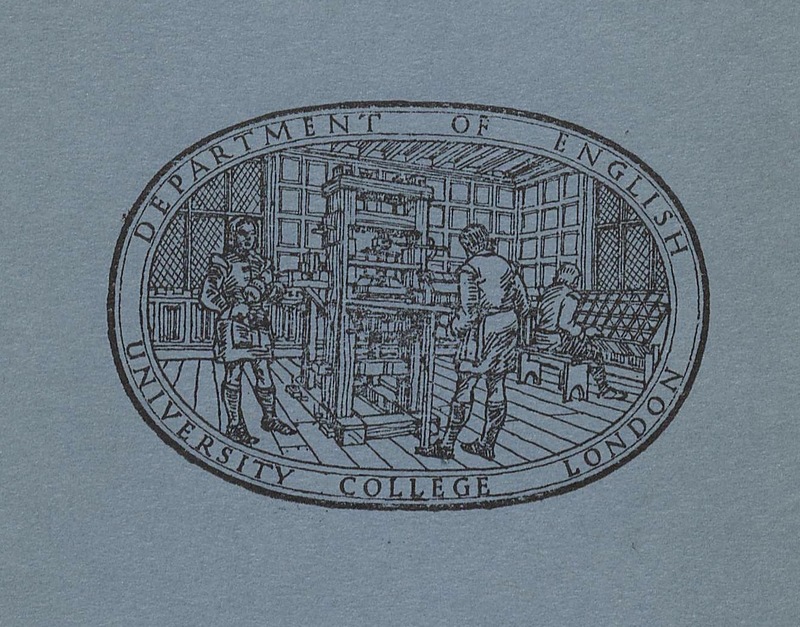 Among those who received copies was former student A.H. Smith, then of University College London, who used his copies of the typescripts as a printing exercise for his own students in 1936. An unknown (but undoubtedly small) number of pamphlets were hand-set and privately printed by students on a replica wooden common press (not unlike the replica press located on the 2nd floor of U.Va.’s Alderman Library in the Stettinius Gallery). Smith realized, after the pamphlets had already been printed, that he had not obtained permission from Tolkien and Gordon, so the pamphlet was never distributed. Instead, copies were kept in storage at the pressrooms on Gower Street. The building was bombed in WWII. The pressrooms burned, along with the presses and any stock stored on the premises. The only copies of the pamphlet that survived were those that had been taken by the students who printed it. It is not known how many copies survived, though H. Winifred Husbands, one of the students involved in the printing, has estimated the number at thirteen. There are thirty compositions in the book, including thirteen by Tolkien himself. Several of the verses reappear in later publications, altered or repurposed. 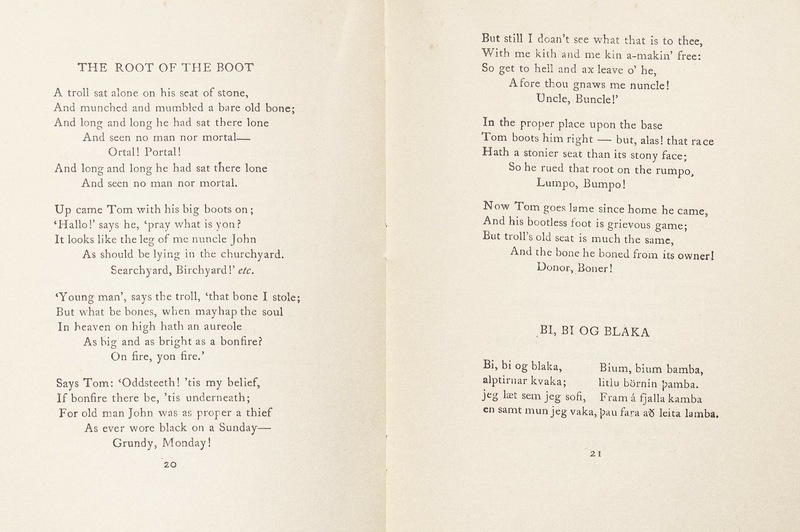 A notable example is the poem “The Root of the Boot.” The poem was originally titled “Pero & Podex” (Boot and Bottom), but is also sometimes referred to as the Troll Song. In early drafts of The Fellowship of the Ring, Frodo sings it in the Prancing Pony in chapter nine. Readers will remember that it finally appears as Sam’s song in chapter twelve of the published version of the same book, and as “The Stone Troll” in Adventures of Tom Bombadil. 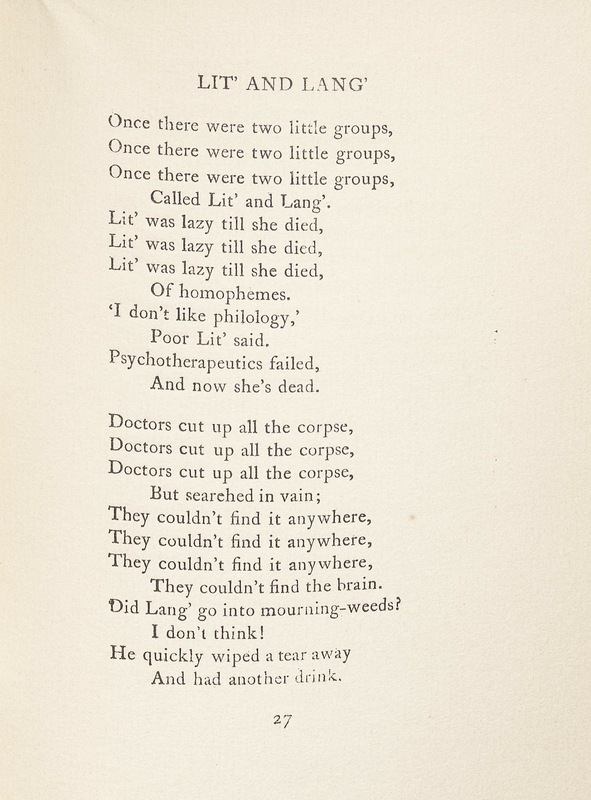 Other poems poke fun at the academic community: Tolkien’s “Lit’ and Lang’” originally contained direct references to Leeds University, and was altered to omit them during printing. Tolkien noted, in 1966, that the alterations had the unfortunate side effect of breaking the rhyme. So how did such a rare find come to the Albert and Shirley Small Special Collections? In late 2013, Joan Kellogg, the widow of Professor of English and expert in Old Icelandic Robert Kellogg, generously invited curator Molly Schwartzburg to take from Professor Kellogg’s home library any volumes wanted for Special Collections. Almost two hundred rare and unusual items, from modern first editions to Icelandic travelogues and books of mythology, came to the library as a result of Mrs. Kellogg’s generosity. Many years ago, Professor Kellogg had donated to the library many remarkable books from the James Joyce collection of his father, Joyce scholar Charles E. Kellogg. Songs for the Philologists lacks a bookplate, so we do not know whether the book belonged to the father or the son; it has strong ties to both of their research interests. The library was pleased to be able to share our excitement about the Tolkien item with Mrs. Kellogg before she passed away on December 31, 2013. 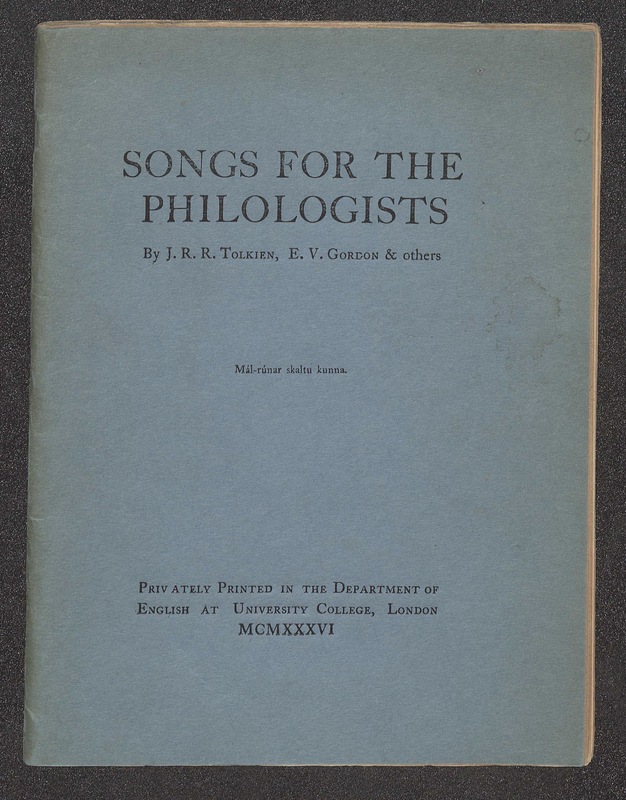 The Kellogg copy of “Songs for the Philologists” is one of only four copies held by libraries in the United States and one of eight held by libraries worldwide. Fantasy fans and Old Norse addicts alike are encouraged to consult the pamphlet for inspiration in starting their own “Viking Club” here on grounds. This entry was posted in Acquisitions, Uncategorized and tagged A.H. Smith, book collecting, Charles Kellogg, English literature, J.R.R. Tolkien, Joan Kellogg, printing, rare books, Robert Kellogg, University College London, Viking Club, WWII by Molly Schwartzburg. Bookmark the permalink. Thanks for a great account of a wonderfully generous donation, Ms. Ott. A copy of this Tolkien “incunable” sold at Bloomsbury in 2003 for 3500 pounds! (And there is one currently available online at vialibri.net for a figure (considerably) in advance of that. It is a fascinating modern rarity! How wonderful! I look forward to seeing it–As for starting a “Viking Club”-count me in! As a Tolkeinite since 1972, this is going to be delightful to have a look at. In the lingo of the day, OMG !! What an amazing addition. Wow, what a great acquisition! Congratulations! I do see a small correction you should make- the Troll Song isn’t sung by Frodo at the Prancing Pony. It’s sung by Sam in Chapter 12, Flight to the Ford, when they see the stone trolls from the Hobbit. Frodo sings about the Man in the Moon at the Prancing Pony. Thank you so much! We’re making a correction–it turns out this is quite an interesting detail in the composition of Fellowship of the Ring. See the blog post for the update. Not entirely true, nor untrue! Yes, in the published version of The Lord of the Rings, Frodo sings The Moon in the Moon at The Prancing Pony. However, in the early drafts, Frodo (then called Bingo) sung The Root of the Boot (HoMe VI: The Return of the Shadow, page 142-7 in my paperback edition). The influence it has had on the composition of The Fellowship of the Ring is dealed with in the same place. This is incredibly cool. Well done UVA and Molly Schwartzburg! Thank you so much for the presentation of this very rare book. I am currently writing an article on Bagme Bloma and I wonder if you would send me a picture of the poem as shown in Songs of the Philologists .